After a long absence, I’ve been sucked back down into the Pinterest rabbit hole. Back when I lived in San Francisco, I was a chicken-raising, organic homesteader who knit my boys clothes, sewed Halloween costumes, and spent way too much time crafting perfect holiday decor. Pinterest was like crack for me. Somewhere between Flagstaff, AZ and Virginia, I lost every ounce of domesticity and crafting I possessed. But let me tell you, cooking those lovely Pinterest recipes is nothing like riding a bike. YOU DO FORGET HOW TO DO IT. Or maybe there are cooking fairies who are boycotting my home. Either way, it is now – after four failed cooking attempts – clear that I may never get my cooking skills back. And yet I persevere. 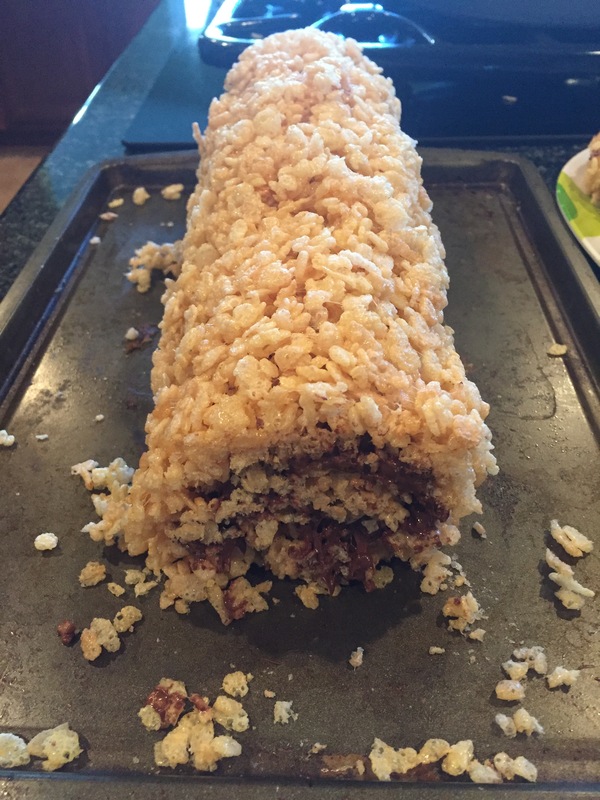 For your viewing pleasure, I present Rice Krispy Nutella Roll-ups. How could this go wrong, you may be asking yourself. Good question. I thought the same. After all, at the very least, I’d end up with a puddle of rice crispys coated in Nutella. 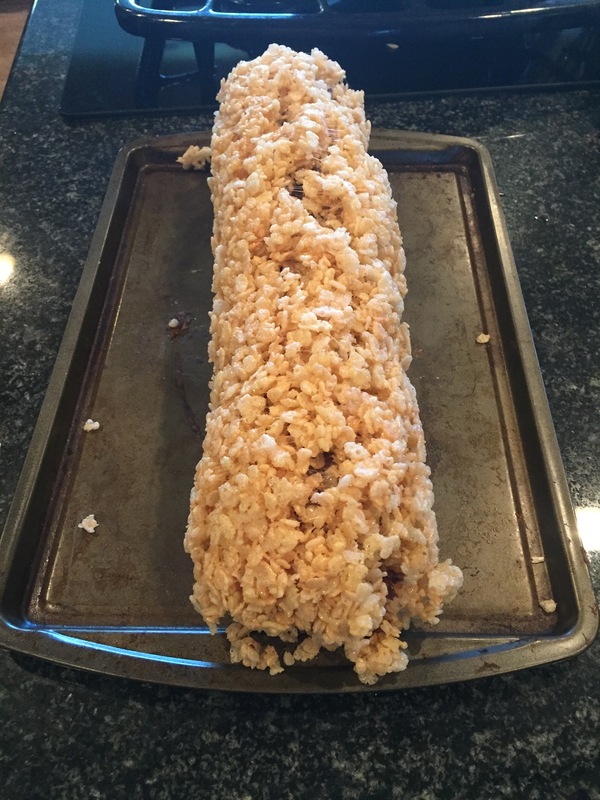 Problem number 1: I excitedly tell the Colonel that we’re going to make special rice crispy treats. He promptly bursts into tears and declares he wants braces. Why braces? Because then he wouldn’t have to eat the evil Rice Crispy treats. In my excitement to craft the hell out of these treats, I forget he hates rice treats. But he likes marshmallows, and I figure if I give him enough it will pacify him. Score: 1 – Mom. We make up the marshmallows and butter and pour in the crispies. 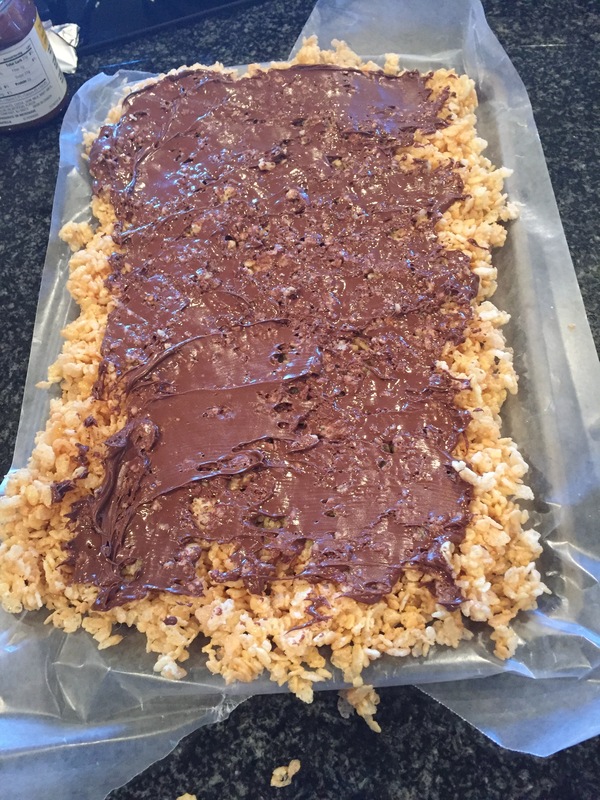 After covering a pan in wax paper, I dump half the mixture on to the pan and spread it out. I let it cool slightly, before spreading the Nutella all over the concoction. Pretty nasty looking, no? And yet I keep on. Next, using the wax paper, I began rolling the whole mess length-wise. I should have known there was a problem when the marshmallows didn’t seem to be holding the crispies together. But nooo…I figured it wasn’t set yet and that it would work better once it was rolled and cooled. Finally, I had a roll! At this point, I noticed the Colonel munching on a bag of marshmallows – the second bag I thought we’d added to the mixture. No wonder it was falling apart! Score: Treats – 1; Me – 1. Next I figured, what the hell, and decided to slice the roll into even pieces. BWAHAHAHAHA. Clearly, this treat was out to get me. A complete mess! Not one roll stuck together. 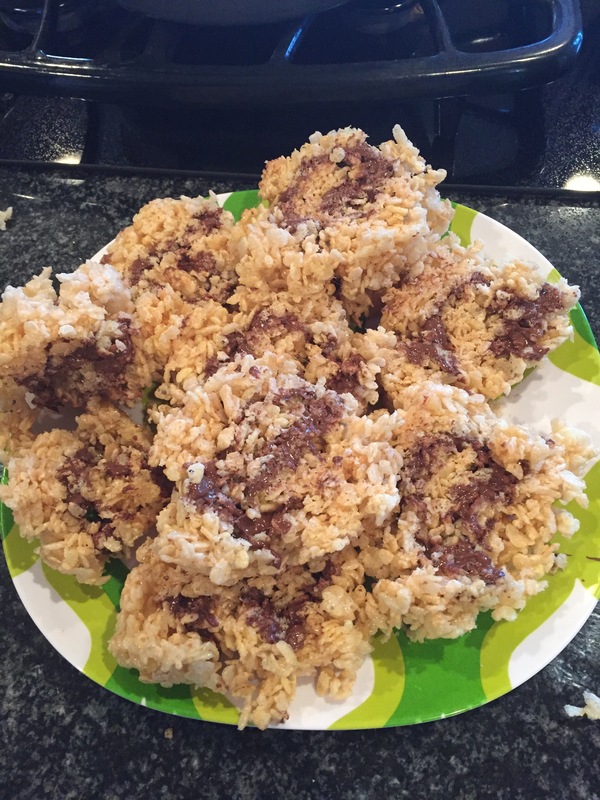 As soon as we picked them up, they fell to pieces, leaving a mess of nutella and rice crispies everywhere. Score: Treats -2; Me – 1. So the lesson here is that next time, I won’t rely on the rice crispie treat-hating Colonel to oversee the marshmallows. If we’d used two bags, I’m sure the whole mess would have stuck together. And that, loves, is my pseudo pinterest fail #4.